This post will remain at the top of our blog as needed: scroll down to see newer entries! Full event package is $350 (this does not include photo blind reservations), ask for details about separate pricing for the Kaufman talk / banquet / etc. Official registration forms do exist! Click here, or on the button below for the registration form! VENDORS: booth spaces are still available; please e-mail h.trudell at gmail.com for information. Vendor area will be free and open to the public. I'll spot you Kenn Kaufman. 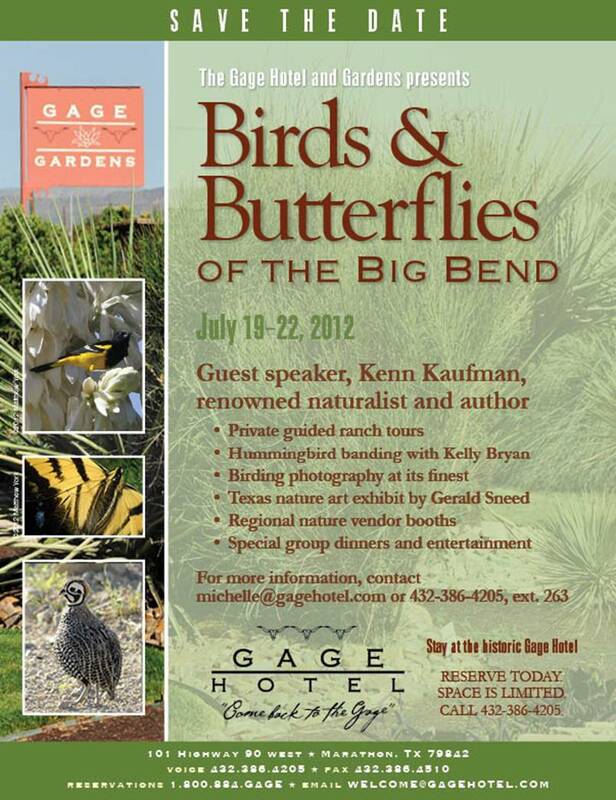 Thanks for your interest in the Gage Hotel's Birds and Butterflies of the Big Bend. The inclusive package for the festival itself is $350 which includes a hummingbird banding workshop the morning of Friday, July 20th and a guided butterfly walk in the afternoon. The Gerald Sneed art exhibit will be followed by a cocktail party and Mexican dinner at the 12 Gage restaurant. On Saturday July 21st there will be a private guided ranch tour in the morning and the Kenn Kaufman lecture in the evening, followed by a banquet at the Gage Gardens. The package also includes breakfast Friday and Saturday, gourmet boxed lunches Friday and Saturday, a VIP packet and special room rates at the Gage Hotel. The Maravilles ranch tour is only available to those purchasing the inclusive package and spaces are limited. Al a carte options will be available for those who do not want the total package. I recommend booking your hotel room early if you are interested because the event has generated a great amount of interest even before we have really advertised. I would also suggest booking Thursday the 19th if you are interested in Friday's activities because breakfast is served early on Friday morning and we will have an informal welcoming party and registration Thursday night. We will have more information and a detailed agenda coming out soon that I would be happy to email you. If you have any questions you may also call me at 432/ 386-4205 ext 263. To book your hotel reservations you may call 432/386-4205. Vince, we'd love to see you again! We'll try to keep the blog updated as things progress, but do feel free to drop us a line with any specific questions you might have! 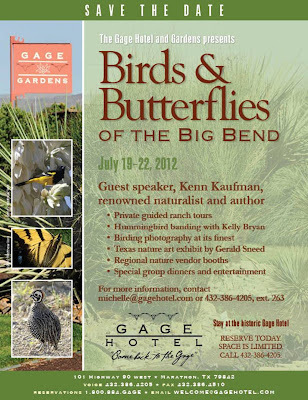 Thanks for your interest in the Gage Hotel's Birds and Butterflies of the Big Bend. 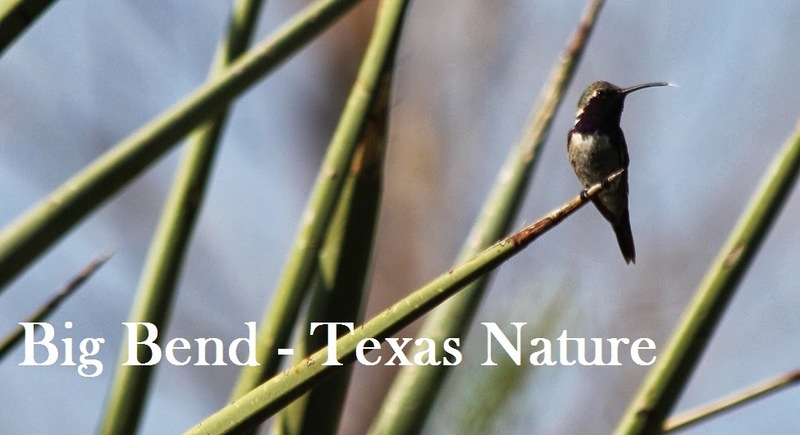 The inclusive package for the festival itself is $350 which includes a hummingbird banding workshop on Friday July 20th and a guided butterfly walk that afternoon, the Gerald Sneed exhibit followed by a cocktail party and Mexican dinner at the 12 Gage restaurant. ranch, the Kenn Kaufman lecture followed by a banquet at the Gage Gardens. inclusive package and there is a limited amount of spaces. I recommend booking your hotel room early if you are interested because the event has generated a great amount of interest even before we have really advertised. I would also suggest booking the Thursday the 19th if you are interested in Friday's activities because breakfast is served early on Friday morning and we will have an informal welcoming party and registration Thursday night. I'm not sure if the official prices have been circulated yet, but the all-inclusive package (minus transportation and housing in Marathon) should be under $400 for two and half days of birding with a social the night before everything kicks off. What/where are the photo blinds referenced in the post? Hi Jeff, there are no permanent photo blinds on any of the properties (yet), so precise locations are TBD. This year's blinds will be temporary and locations will depend on feasibility - we are still open to suggestions as to what kind of temporary blind and habitat preferences. the grange needs to be paying you commission or a percentage or something.